BlackBerry Bold 9700 Officially Announced | BlackBerry Blast! RIM has officially announced the BlackBerry Bold 9700. We've all seen the pictures of the "Oynx" and read about the specs, but the official press release came today. Some of the improvements over the BlackBerry Bold include a 3.2 megapixel camera, 360 x 480 display (over a 320x480 on the Bold), an optical trackpad instead of a trackball, and BlackBerry OS 5.0. Look out world, here comes the BlackBerry Bold 2. Waterloo, ON - Research In Motion (RIM) (Nasdaq: RIMM; TSX: RIM) today announced the sleek and powerful BlackBerry� Bold� 9700 smartphone. The new BlackBerry Bold 9700 offers an extensive array of high-end communications and multimedia features in a compact and highly refined design that will appeal to both men and women and for both professional and personal use. The BlackBerry Bold 9700 smartphone offers top-of-the-line performance, functionality and features with support for 3G HSDPA networks around the world, a next-generation (624 MHz) processor, 256 MB Flash memory, built-in GPS and Wi-Fi�, a 3.2MP camera and a sharp, dazzling display. Cutting edge engineering and premium finishes extend to the exterior of the handset as well, with a smoothly integrated touch-sensitive trackpad and a highly tactile, distinctive, fretted keyboard. The dark chrome frame and leatherette back add to the new smartphone's sleek and elegant look, while the narrow profile, balanced weight and soft-touch sides allow it to feel incredibly comfortable in one hand. "The BlackBerry Bold 9700 builds on the success of the original BlackBerry Bold with new, state-of-the-art features and a smaller, lighter and highly optimized design that looks, feels and performs great," said Mike Lazaridis, President and Co-CEO, Research In Motion. Access to BlackBerry App World�, featuring a broad and growing catalog of mobile applications developed specifically for BlackBerry smartphones. Categories include games, entertainment, IM and social networking, news, weather, productivity and more. 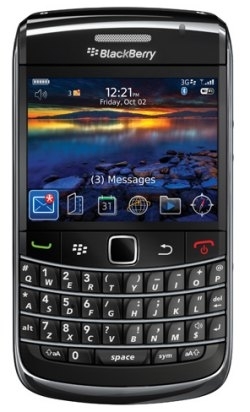 The BlackBerry Bold 9700 smartphone is expected to be available from carriers around the world beginning in November. For more information visit www.blackberry.com/bold9700. ** Certain music files may not be supported, including files that contain digital rights management technologies.